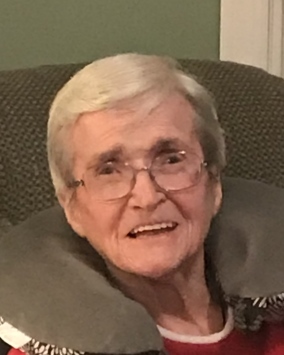 Frances C. Jenks, 87, of Eatontown, passed away peacefully at home surrounded by family on October 10, 2018. She was born in Brooklyn, NY to Benjamin and Catherine (Condon) Rittenhouse and then raised by her Aunt Fannie and Uncle Bill Rittenhouse. Frances worked for and retired from Central Jersey Bank and Trust in Eatontown. Frances was predeceased by her parents, her brother, Harold, her sister, Grace, her twin sons, Michael and Thomas and in 1970 by her beloved husband, Michael T. Jenks. She is survived by her children: Tim (Laura) of Oceanport, Catherine of Eatontown, Daniel (Nancy) of Ocean, Michelle of Eatontown, Charlie of Santa Cruz, CA and Mark of Oakmont, PA, her grandchildren: Michael, Brian, Melissa, Sean, James, Nicole, Alexandra, Ryan, Andrew, Patrick and Charlie and great-granddaughters, Bella and Cadence. Frances will be remembered for her strength and compassion in raising her 6 children alone after losing her husband. In addition, she was a loyal friend to many. She was a longtime communicant of St. Dorothea’s RC Church where she loved attending Mass and singing. She was a proud member of the Gold Star Wives. In her free time, she enjoyed playing bingo, the lottery and watching her soap operas. Her love and devotion to her family was the focus of her life. Family and friends may visit on Friday, Oct. 12th from 4-8pm at Braun Funeral Home, 106 Broad St., Eatontown, NJ. A funeral home service will be held on Saturday, Oct. 13th 9:30am followed by burial at Mt. Olivet Cemetery in Middletown. Memories and condolences may be shared at www.braunfuneralhome.com.